“Leon is an expert and my ace-in-the-hole when it comes to creating dynamic marketing copy for my clients evergreen information products. “Leon is terrific at recognizing what is necessary to create excellent content. “I just hung up the phone from my session with Leon Altman. 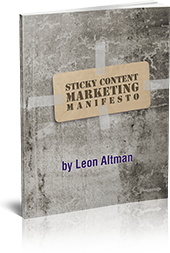 “Simply put, Leon is one of the best copywriters and marketing strategists I know. “I’ve worked with Leon since the early 1990’s. “Not only is Leon a great copywriter–he’s also a topnotch marketing strategist. He can spot any weaknesses in copy as well as in marketing funnels , strategy or overall direction. His coaching, critiques and recommendations are worth gold. I’ve been in this business for a long time and have coached hundreds of small businesses. Leon is the first person I turn to for marketing advice . . . .
My conversion rate was around 30% for webinar registrations (the people who hit the webinar registration page registered). “Leon, thank you so much for your critique on my Opt-in Page. “I’ve worked with Leon for many years. “Leon is a pleasure to work with and was very helpful! “I have worked with Leon on web content and blogging. “I especially want to thank Leon Altman for his feedback on my site. “I’ve worked with Leon Altman for many years.